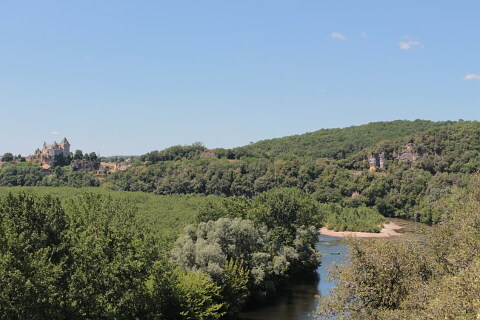 Montfort village is a small village that is dominated by the chateau at the highest point in the village - the river at this point follows a large sweep known as the cingle de Montfort and sits between Vitrac and Carsac. 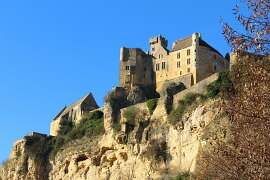 Curiously the chateau is named after Simon de Montfort, who burned the castle to the ground as part of his crusade in the region. 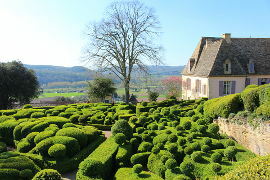 Perhaps rebuilt more than any other castle in the region, chateau de Montfort has been knocked down and reconstructed four time during the intervening centuries. 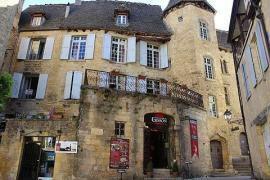 The castle sits above the village and the river and has views over the lovely countryside filled with woods and orchards. 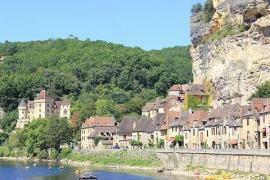 If you see the castle from the river you will see that it is perched perilously on a large outcrop of rock above the river Dordogne. 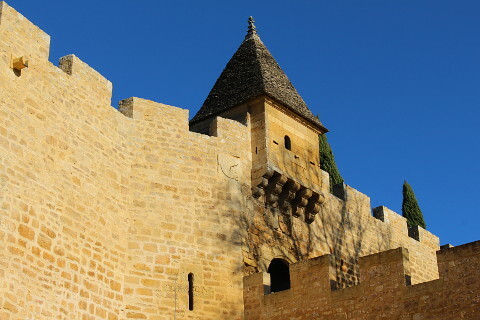 One corner of its defensive walls seems to be constructed on a narrow tower of rock which looks like it could fall at any moment! 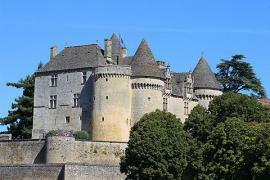 If you are lucky enough to be canoeing this stretch of the river you will get one of the best views of the castle. 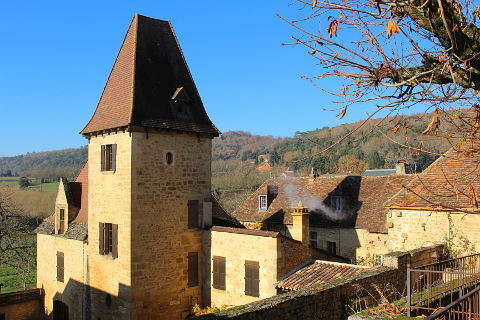 Montfort village and Chateau are just 7 km from Sarlat. 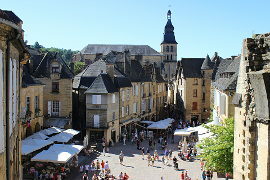 The place de la Mairie is in the centre of the village and on the square is the église Saint-Martin built in the 12th century. 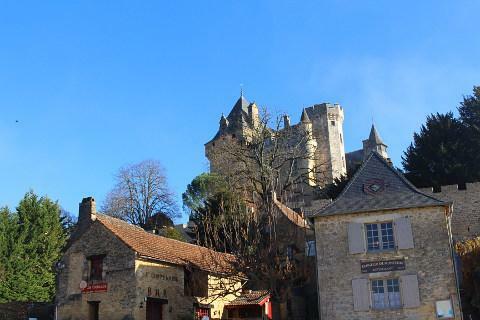 Park below the castle next to a couple of bar-restaurants and have a wander through the village. 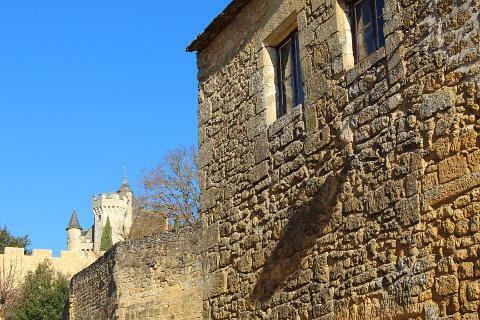 The buildings of the village are charming with their yellow stone walls, deep perigordine roofs and a range of architectural features including some interesting chimneys. 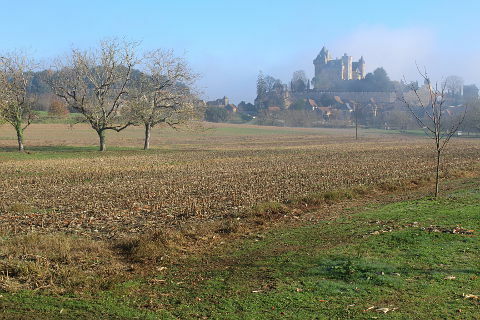 As you walk you can get some tantalising views of the castle but unfortunately the chateau is private and cannot be visited. Take a look at the dolmen of Peyre Levade but known locally as the 'devil's stone'! 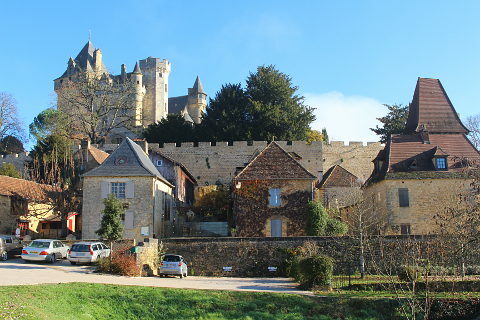 When you leave the village drive a little further on to the Cingle de Montfort where you have lovely views over the cingle (deep bend in the river) and the chateau itself. 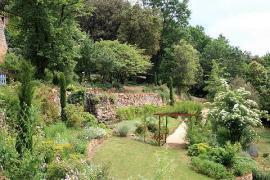 There is a very nice garden called 'Le Clos des Source' at Vitrac. Well worth a visit. 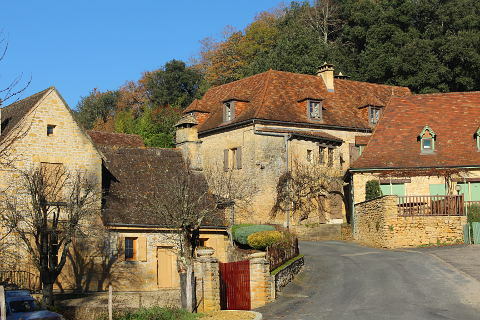 The stunning village of Domme is one of our favourites in the Dordogne area. 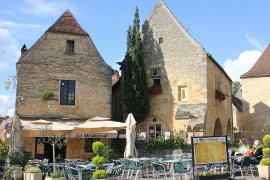 As well as the village you can visit the caves which lie under the village centre.